The success of a recruitment advertising campaign. Coming to a TV screen near you. It is great to see just how successful a recruitment advertising campaign can be. We have previously used this Blog to discuss the public information advertising campaigns we have delivered for Surrey Police but we would now like to highlight another campaign that has a strong connection with a new TV series currently being aired on ITV. ‘Rookies’ is a new documentary focusing on the lives of seven ordinary people who have made the life changing decision to become Police Officers with Surrey Police. With exclusive access to Surrey Police, the rookies and their families, this series reveals what it is like to be dropped onto the front line of law enforcement without a lot of experience and the impact on the rookies’ loved ones. Filmed over six months as the officers leave training school and go out on patrol under the guidance of their tutors – the programme documents some of the toughest and challenging aspects of being a police officer including coming face to face with violent and abusive criminals, working to support vulnerable people and dealing with fatal incidents. So, what has led to them becoming Police Officers? For sure, some of them have dreamt of this role from an early age whereas others simply wanted a change from their previous jobs (which include a dance teacher, software developer, lifeguard, ski instructor and a phlebotomist!). Throughout 2015, Surrey Police ran a very successful recruitment campaign. And, from what we are told, the most successful recruitment advertising campaign they had ever done. In terms of increase in numbers of applicants, the campaign led to a rise of an astonishing 500% over the previous year’s version. That would make an impressive percentage for anyone to quote in an interview! So, why are talking about this? Well, it’s because that recruitment advertising campaign was devised, designed, produced and delivered by Design Inc. And, we are very proud of that. The striking black and yellow headline in the advertising is supported by the presence of one of three different toy figure characters, which were drawn from scratch to resemble Lego characters, and representing male, female and ethnic diversity in police officer recruitment. 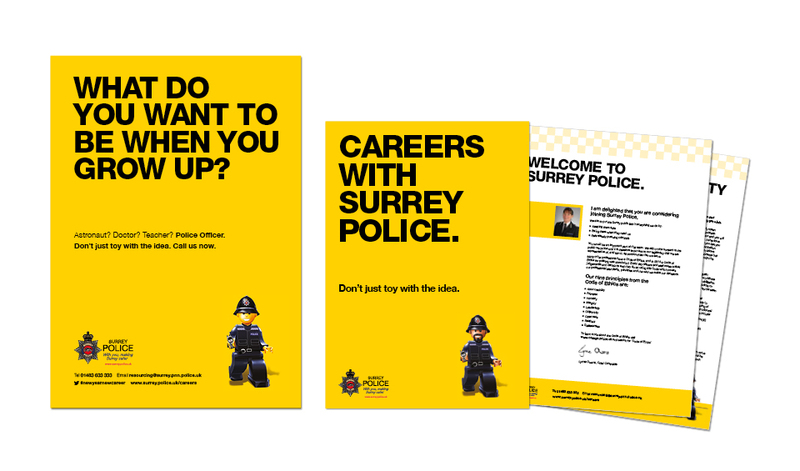 The campaign was specifically designed to capture the imagination of ‘children of all ages’ to promote the fact that a career with Surrey Police is a truly grown-up role. Moreover, from research, we surprisingly found that many children cited ‘police officer’ as the answer to the question ‘what do you want to be when you grow up?’. Much in the same way as ‘train driver’ was chosen in the 50s, ‘astronaut’ in the 70s, ‘footballer’ in the 90s. These days, ‘pop star’ and ‘footballer’ are very much at the top of that list. ‘Police Officer’ appears a few places below. This recruitment advertising campaign saw advertising within a large number of local publications, as interior and exterior bus posters, bus stop shelters throughout the county. Moreover, large format posters were printed and published at many Surrey train stations. Naturally, the campaign didn’t extend to advertising alone. This also included the development of Information Packs for applicants – including a branded typographic treatment of all the ‘unofficial’ roles a police officer can end up fulfilling in the community. To see more of our work for Surrey police including other, more sensitive campaigns, please click here. To view our advertising portfolio, please click here.